John 10:10 is a promise fulfilled. Jesus came down to Earth so that we would have life – and have it abundantly! • Teenagers knowing and believing who they were created to be – because our identity changes everything! • Youth groups that discuss issues such as sexuality and relationships with teens. • Parents equipped to create safe spaces for teens to wrestle with the differences between our culture & our faith. • Students who have been set free by the power of the Gospel and understand how the Good News equips us to fully live out our earthly relationships. So, buckle up, as we take this journey and look at what God has to say about friendships, relationships, sexuality, dating, and ALL the things in between. 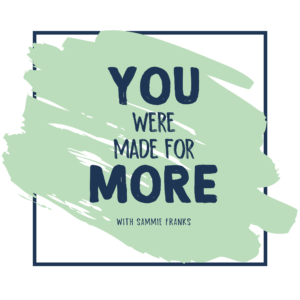 In Episode 1, you meet our host - Sammie Franks - and learn all about her heart behind making sure every person hears the words "you were made for more." Receive a notification when a new episode is posted! Is there someone we should feature on the podcast? Let us know!